ETT Punjab SCERT D.El.Ed 2019: The State Council of Educational Research and Training (SCERT), Punjab will release notification of admission to Diploma in Elementary Education (D.El.Ed) course in government and private affiliated institutions as National Council for Teachers Education (Recognition Norms and Procedure) Regulations. ETT Punjab 2019 will be declared in the first week of June 2019. SCERT, it will be 2 years Diploma course in elementary education. The entire detail of ETT Punjab 2019 such as eligibility criteria, the selection process is mention below. The course is run by the State Council of Education Research and Training, Punjab (SCERT). Aspirants may start to fill the application form by 1st week of June 2019 at scertpunjab.org. The application and processing fee of ETT Punjab 2019 will be different for applicants who belong to different categories from Rs. 300/- to Rs. 600/-. It is advised to applicants to check eligibility criteria before apply. How to Apply for ETT Punjab SCERT D.El.Ed 2019? The official notification is yet to be released by State Council of Educational Research and Training (SCERT), Punjab. Registration for ETT Punjab 2018-20 is Closed. Applicants who wish to get admission in ETT Punjab 2019 has to fill the application form as per scheduled date which is mention below. The educational session of 2019-2021 will begin from 3rd week of 2019. Open the official website link of SCERT, Punjab. Then, Read all the instruction carefully. After reading, click on Apply online. Fill the all authentication form details. Click on “submit form” button. Enter information regarding your exam related, personal, academic, address, guardian. Check all the filled information of candidate & click on Submit. Keep saving your application number for future use. Applicant checks his/her mobile number & email ID. Click on Upload Scanned Image. Upload scanned a photograph, the signature of applicant & parents/guardian images in a format which mentions in information brochure. The application & go for fee submission. Lastly, take a printout for future use. Applicants can fill registration fee by online mode only. He/she can use a Debit card, Credit card, and Net banking methods for payment. The information regarding application form fee has mentioned below. The D.El.Ed course shall be of the time duration of 2 years. But, the students shall be allowed to complete the course within a maximum period of three years from the date of admission to the course. It is informed to the candidate to read instructions from the information brochure carefully before filling up the application form. Candidates who fail to fulfill any eligibility criteria will be disqualified from the ETT Punjab 2019. Therefore, it is required that the applicant fulfills all the eligibility for the exam. Eligibility criteria of ETT Punjab 2019 are mention below. The applicant has to pass or appear in 10+2 final exam or equivalent are eligible to appear for the entrance test. But, the candidate should pass the exam by the time of admission. The applicant who has passed the class 10+2 will be eligible for ETT Punjab 2019. For all Colleges and institutions, Reservation for admission shall apply as per the Punjab government Policy. In case of a tie in the merit of qualifying examination i.e. 10+2, preference will be given to applicant higher in age. In case of a further tie of such applicants, preference will be selected to candidates having higher marks at Matric Level. The State council of educational research and training (SCERT) – Punjab will release the Merit List for Arts, Commerce, Science and Vocational subjects. The online counseling of ETT Punjab 2019 will consist of three phases. Director ranked officer of State will supervise the whole counseling/admission process. The principals of DIETs and Private institutions shall scrutinize the documents of the applicants who are provisionally allotted their colleges and institutes through online centralized counseling. The entire admission process will be conducted in three phases. 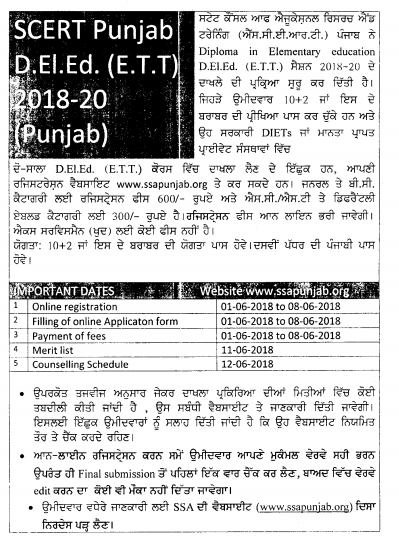 Download SCERT Punjab Guidelines for Admission in DElEd Couse 2018_20 PDF Here. 2 colored passport size photographs. The intake of seats in ETT Punjab 2019 for Humanities, Science, Commerce and Vocational Streams will be in the ratio of 60:20:10:10 seats respectively as per combined merit for any college and institute. But, if any seat remains unfilled in a particular stream due to non-availability of applicants, the same will be merged in another category/stream on combined merit basis. As per policy of 60% of seats in private colleges and institutions will be filled on the basis of joint merit through centralized online counseling by the SCERT Punjab and remaining 40% seats of management quota will be filled by the concerned institution subjects to fulfillment the minimum academic qualification as per notification. The respective college/institution will take permission from SCERT before starting the admission process for the 40% management seats. Fees – The Private D.El.Ed college/institution will take fees as decided by the fee fixation committee and approved by the Department of School Education Govt. of Punjab.